Want to know what it takes to turn a big empty box into a class-A self-storage facility? Adapting an existing building offers investors a fast and relatively easy way to create a new storage business. Changing a property’s use to self-storage can also be extremely lucrative. But conversions also have unique challenges and drawbacks. 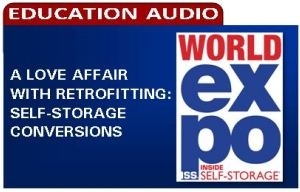 Our presenter will take you through a series of real-life case studies that illustrate the different stages of retrofitting, from beginning to end. Get an insider's view on the process, pitfalls, benefits and drawbacks.